Secretariat has truly captured my heart. He was the world's greatest racing legend. The most amazing, loving, spirited horse that ever existed in the world and the best horse ever to be written in the JC. So legendary, his name can never be used for any other horse in JC (jockey club). He had a heart of gold. Just the other day, I was watching Secretariat's last footage before he was put down from an incurable foot disease called laminitis. It was an old video on YouTube. 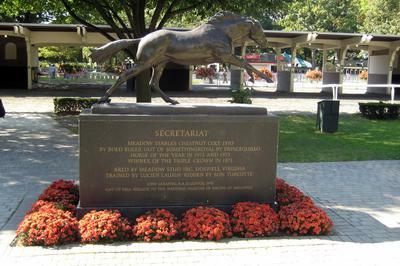 It literally made me cry at the end when they let Secretariat run one last time before they put him down on Wednesday, 1989. It was so touching. I just wanted to put this tribute out to this amazing horse who has captured many hearts. Thank you Secretariat! Rest in peace, our amazing legend and friend. He was the MOST A....M...A...Z...I...N....G..... horse who ever lived, I want to draw another picture of him... He's one of my fave horses.